Alexa is Amazon’s cloud-based intelligent voice service and the brain behind tens of millions of devices. 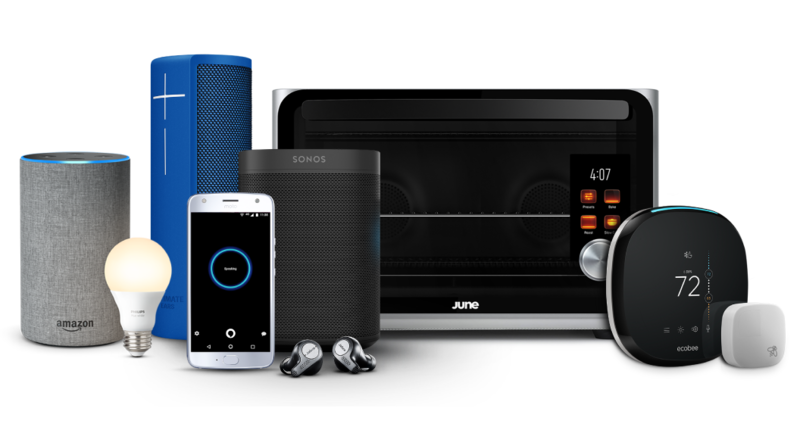 Customers talk to Alexa through the Echo family of devices and over a hundred third-party products with Alexa built-in made by the world’s leading consumer electronics brands. There are also tens of thousands of third-party Alexa-connected devices. With Alexa, device makers can build voice-forward products that offer a natural user interface and reach customers across the globe by joining the network of Alexa devices, skills, and services. You have the flexibility to build devices with Alexa built-in that customers can talk to directly, and connect your devices to the Alexa solutions below. Build voice-forward devices using the Alexa Voice Service that customers can talk to and enable access to cloud-based capabilities, including music, information, smart home control, and tens of thousands of Alexa skills. Certify your devices through the Alexa Built-in program to make it easy for customers to discover them on Amazon.com and to ensure an intuitive, hassle-free experience. Connect your devices to Alexa and enable customers to control them from tens of millions of Amazon and third-party devices with Alexa built-in. Customers can use their voice to control smart home devices or enjoy how Gadgets react to the way they use their Echo devices. Certify your connected products through the Works with Alexa program to make it easy for customers to discover them on Amazon.com, and to ensure an intuitive, hassle-free experience. You can learn how to build common devices by choosing one of the examples below. Or you can build any device you can imagine using development tools for the Alexa Voice Service and Alexa Connected Devices.